Host nation China topped the medal table at the IAAF World Race Walking Team Championships in Taicang, while Tom Bosworth was the best British athlete with a 14th-place finish in the 20km event. The senior men’s 20km race on Sunday had been the final event of the championships and it saw Japan’s Koki Ikeda win gold in 81:13 ahead of China’s Wang Kaihua with a time of 81:22, while Italy’s Massimo Stano claimed bronze in 81:33. Commonwealth silver medallist Bosworth had been in 12th place at the half way point, 12 seconds behind leaders Wang and Germany’s Hagen Pohle, in a pack with Ikeda and Stano. 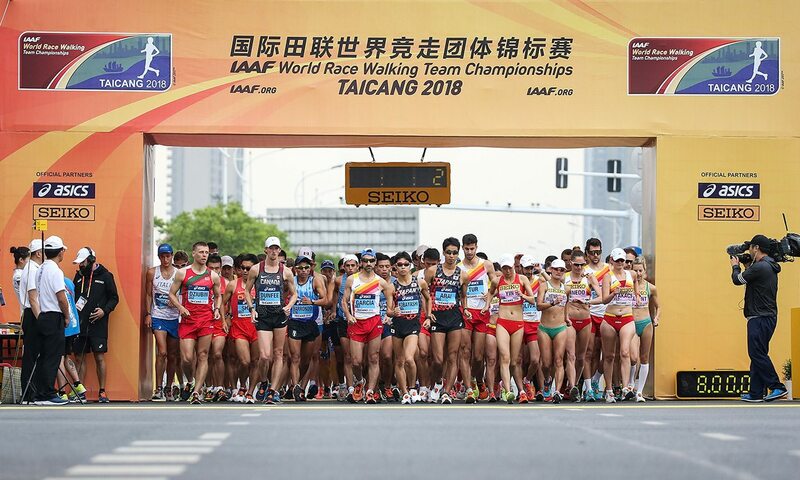 For the first time at this event, the races in Taicang featured a pit lane area, in which 20km athletes were required to wait two minutes if they were shown three red cards. If another red card was received after that, the athlete would be disqualified. The pit lane time for the under-20 10km races was one minute, while it was five minutes for the 50km events. On his approach to the 14km mark, Bosworth was shown a third red card, so spent two minutes in the pit lane. He was in 24th place at 15km but worked his way up to 14th in 83:54 by the finish. The Olympic sixth-placer, who had clocked a British record of 79:38 to claim 20km race walk silver for England on the Gold Coast, was making his fourth successive World Race Walking Team Champs appearance. “A mixed day,” he wrote on Twitter. “New rule meant three cards = pit lane. A mixed day, new rule meant 3 cards = pitlane. Australia’s Olympic bronze medallist Dane Bird-Smith, who claimed Commonwealth gold ahead of Bosworth, pulled up half way into the race. Japan claimed the team title ahead of Italy and China. On the first day of action, Mexico’s Maria Guadalupe Gonzalez had become the first athlete in the history of the championships to successfully defend the senior women’s 20km title, clocking 86:38 for victory. The world and Olympic silver medallist won ahead of London 2012 silver medallist Qieyang Shijie, who secured silver on home soil in a time of 87:06, and her Chinese team-mate Yang Jiayu, who had beaten Gonzalez to the world title last year in London but this time bagged bronze in 87:22. Like Bosworth, Britain’s Bethan Davies, who set a personal best of 91:53 in Switzerland in March and then claimed Commonwealth bronze for Wales in Australia, was among the athletes to visit the pit lane area and went on to clock 97:31 for 64th place. Her team-mate Gemma Bridge, who was fifth on the Gold Coast and has a PB of 92:33, clocked 95:43 for 53rd. China won the team title ahead of Italy and Spain. China’s Liang Rui delighted home fans with a world record-breaking performance to win the women’s 50km title on her debut at the distance. Clocking 4:04:36, she improved the world record set by Portugal’s Ines Henriques at last year’s IAAF World Championships by 80 seconds to win ahead of her team-mate Yin Hang, the world silver medallist, who crossed the line in 4:09:09. Australia’s Claire Tallent, who had been left devastated after being disqualified when racing over 20km on home soil at the Commonwealth Games, claimed the bronze medal on her 50km debut, clocking an Oceanian record of 4:09:33. Henriques dropped out at around 29km. China won the team title ahead of Ecuador and Ukraine. Japan claimed a clean-sweep of the medals in the men’s event as pre-race favourite Hirooki Arai, the world silver and Olympic bronze medallist, won in 3:44:25 ahead of Hayato Katsuki with 3:44:31 and Satoshi Maruo with 3:44:52. Securing team silver behind Japan was Ukraine, led by Marian Zakalnytstyi in fourth, while Poland claimed team bronze. World U18 champion Zhang Yao won the U20 men’s 10km title in a personal best of 40:07 to lead a Chinese one-two ahead of Wang Zhaozhao, who clocked 40:12. Jose Eduardo Ortiz of Guatemala claimed bronze in 40:17. China won team gold ahead of Japan, while Australia claimed bronze. The U20 women’s race was won by Mexico’s Alegna Gonzalez with a North American U20 record of 45:08. Ecuador’s world U18 champion Glenda Morejon claimed silver in 45:13 and Japan’s Nanako Fujii bronze in 45:29. China claimed another team title ahead of Ecuador and Turkey.